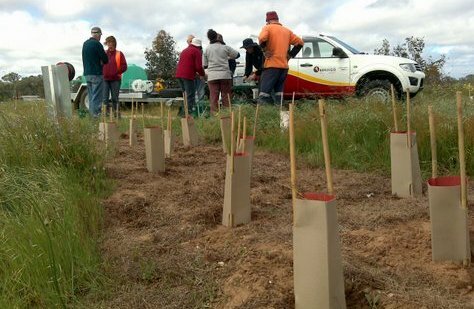 The O’Keefe Rail Trail and Heathcote will be the focus of the City of Greater Bendigo National Tree Day activities, with a community planting in Herriot Street between 10.00am and 1.30pm on Sunday July 27, 2014. National Tree Day is Australia’s largest tree-planting event. Each year over 200,000 people take part in National Tree Day events at 3,000 sites across the country. Since National Tree Day was launched in 1996, more than three million participants have planted 20 million native trees, shrubs and grasses. City of Greater Bendigo Manager Sustainable Environment, Robyn Major said this year’s planting site has been chosen because this area adjoining a new section of the O’Keefe Rail Trail lacks tree cover. Over 4000 native trees and shrubs are expected to be planted on the day and everyone is welcome to take part. “The O’Keefe Rail Trail is an important recreation and conservation asset and the tree planting will greatly improve and beautify the area. It will also compliment the work currently underway to develop the rail trail itself,” said Ms Major. “In addition to the planting there will also be children’s art activities and the Heathcote Lions Club will provide a free barbecue for everyone who participates. “Each year the City of Greater Bendigo partners with a different local Landcare or community group to help coordinate a planting on a community site, and this year’s tree planting event has been organised with assistance from the Friends of the Bendigo Kilmore Rail Trail and Heathcote Lions Club. “Both of these groups do valuable work in our local community and the City thanks them for being our 2014 National Tree Day partners,” Ms Major said. All participants are asked to wear suitable clothing, footwear and gloves. Please bring a hand trowel if they have one, planting tools will be supplied. Participants are also asked to register at the desk adjacent to the planting area on arrival. Children under the age of 18 must have a parent or guardian accompany and register on their behalf. Further information can be obtained by contacting Anthony Sheean on 5434 6374 or 0419762787.